Today's post is all about Thanksgiving: what to wear, what to eat, and how to make your house smell like the coziest, most lovely fall inspired place on the planet!Some people have very fancy Thanksgiving dinners and others have a more laid back day, so I've tried to incorporate both! Firstly, and in my opinion most importantly, what to wear! Last year I wore an outfit almost identical to the cream skirt and wine colored sweater.I paired it with tights and riding boots and absolutely loved it, which is why I'll be doing something very similar again this year. It's such an easy outfit to put together and very comfortable, especially if you are traveling a ways. For a more casual family dinner, I love the look of a beaded sweatshirt and your favorite skinnies! It's cute and classy but isn't too dressy, and it leaves a bit of room for your after Thanksgiving dinner food baby! (I mean, that's not just me right?) The third outfit on the left is exactly what I'm wearing this year. It's easy as it's just a button down and an elastic waist-ed skirt, but with tights and flats, it's going to be classic prep! I'm obsessed with the loafers and since I own everything else pictured, I may just have to scoop those up as well! As far as accessories go, that Cambridge satchel is at the top of my Christmas list! I think the light brown goes with everything and it can be monogrammed, yes please! Leather just says fall to me, so any leather bag would go well with any of these outfits! The red lipstick is Rimmel Kate Moss 107 and I. Am. Hooked. I bought it a few weeks ago and every time I wear it I love it even more. It's matte so it can be hard to put on at first, but it stays forever and is just the perfect deep red for autumn! My pearls and monogram necklace never leave my body, so I will definitely be wearing them, but I think they do a great job of adding the finishing touches to an outfit by making it look a bit more polished. They aren't statement pieces so they don't dress an outfit up, but they certainly don't dress it down and are easy to pair with anything! Perfect for me! To see where the clothes in the photo came from, simply click the picture and it will take you to the polyvore page! While some of the sweaters and things are on the expensive side (I obsess over anything J.Crew), I have found that Target and Old Navy have great selections this year, as well as Forever 21, Asos, and TopShop. Pumpkin pie is always talked about during Thanksgiving, but for my family, it's all about the pecan pie! I really can't stand mushy textures so pumpkin just won't do! 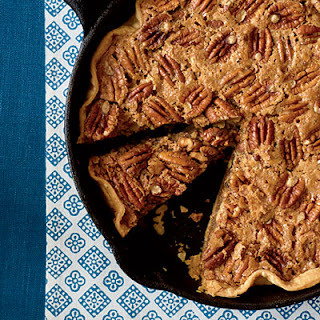 I've linked you to a few good recipes for pecan pie down below, courtesy of Southern Living! I'm partial to a classic pecan pie, but they all look delicious so I don't think you can go wrong! I like that they include hors d'oeuvres as well as full out pie options! It makes it easy for guests to have finger food desserts too! Click for 15 ways to do pecan pie! Can I just tell you how much I love candles? To me they do a great job of setting the mood and can perfect the atmosphere. You may think the smell of home cooked food is enough, but trust me, these candles are to die for! My absolute favorite this fall is the Pumpkin Spice candle from Glade. Are you tired of hearing about it yet?? It has a cinnamon scent that just fills the room without being too overwhelming. I burn it with Salted Caramel, also from Glade, and they make my room smell amazing. Salted Caramel still has a bit of a spice undertone, but is a bit sweeter than Pumpkin Spice. As for Yankee Candle, my sweet favorites are Apple Pumpkin, Banana Nut Bread, Caramel Pecan Pie, and Sweet Potato Pie. I also think Autumn Wreath is super festive but it's back on the spicier side! If you're like me and are already skipping ahead to Christmas, Christmas Cookie is my absolute favorite! While Yankee Candles are a bit more expensive than Glade, they are also bigger and they have much more scent variety. The quality is well worth the money in my opinion! So that's it for me! I can't wait to see my family and eat a home cooked meal (dorm food just isn't cuttin' it)! I have so much to be thankful for this year and lots coming up next year and I can't wait to celebrate with all my family. My favorite part is just getting to see everyone you don't normally see and being all warm and stuffed. Family time = the best. What are your Thanksgiving plans? Do you have a favorite recipe that your family always makes or an outfit you can't wait to wear? The business plan could take hundreds of hours to prepare, depending upon the experience and knowledge of the planner or entrepreneur as well as the purpose of the planning. Its time to say I need help write my paper for me to make your grades batter.